Collagen covers 30% of the whole protein content in the body. It is found in the whole body and organs like our bones, cartilage bones, ligaments, blood vessels, skin and other parts. Its main functions are regaining the tautness, moisture and shine of the skin as well as maintaining the structure and shape of our internal organs. Besides that, it is also an essential ingredient for regenerating damaged tissues. Tests and researches found that collagen in the body deteriorates after the age of 20-25 years old. Therefore, appropriate intake of collagen daily is necessary. The collagen is derived from deep sea fish sources with modern technology. Its nano sized molecules ease absorption and digestion of the body. It provides moisture and hydration to the skin. It also promotes hormone balance with its hydration reaction and skin tautness. Source of the strawberry extract or also known as 'polyphenol' is from Australia and produced with patented technology from Japan. Strawberry extract is rich with polyphenol, vitamins and nutritional folic acid. It acts as an anti-oxidant and helps the liver in the detoxification process. 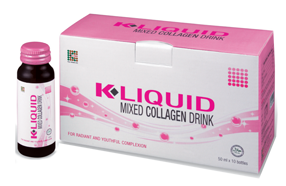 K-Liquid Mixed Collagen Drink is enhanced with apple extract and apple juice which is rich with Vitamin C, effective to help brighten the skin for glowin-looking skin as well as helps to improve absorption of collagen in the body.